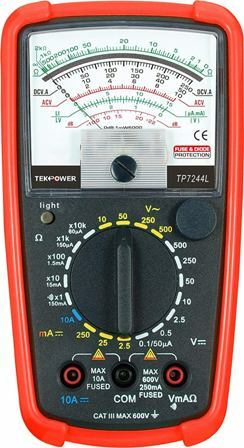 The Tekpower TP7244L is a decent quality, value for money analog-style multimeter aimed mainly at DIY types. It is also useful for those in the trade as a secondary device, with 20 ranges, lighted screen and tough case. Not many go for analog meters nowadays, but if you need to closely monitor small changing values, they can’t be beat. As with most other analog meters, the Tekpower TP7244L lets you measure the important criteria, including volts, DC amps and resistance. You can also perform diode/LED and decibels tests. It is a slight upgrade over the TP7244 in that it comes with a lighted screen. While not a true backlight suchlike digital meters have, it makes a big difference in the dark. There is also an AC voltage detector at the top of the unit and it has a strong case. The continuity tester has a beeper and a fair response time with low impedance. Also, like most others, there’s no off position. It doesn’t need one since it only uses power when you’re testing continuity/resistance, and when the light is on. The TP7244L is especially useful for close DC work, with low voltage and current ranges – under 10V and in the micro-amps range. It’s also quite responsive and accurate and works especially well when checking out variable resistors, capacitors and flame or throttle sensors, for example, where slow and steady changes can be discerned. There are a few negatives, such as static build up on dirty screens shifting the pointer on occasion and possible zeroing issues. It is also worth changing the batteries for good quality ones – if it indeed does come with them. They are AAs (x2). Though a more budget oriented Chinese brand, Tekpower churns out some good meters and is well known. The TP7244L is quite rugged for an analog meter, having a softer case to absorb knocks and modest drops. Note: It is not a holster and the tilting bail can be a pain to get out. Enclosure fixings are self tappers. Probes are standard and come with protective caps. Display: Being large and analog, it is easy to read, though newcomers might find the range-to-needle conversion confusing at first. Just remember that the different sets of numbers under a given range relate to the dial switch position. The display is lit by a couple of LEDs, which provide ample brightness – be sure to pick the TP7244L and not the TP7244 (without the ‘L’) if you want it with lights. Both inputs are protected, with a 250mA fuse across the main (red) test terminal and a 10A fuse on the high amperage (black) one. These are of the cheaper quick blow type as opposed to the quality HRC ones which you’d find in higher spec’d meters. Category rating is touted to be CAT-III 600V, but avoid high energy, three phase testing to be on the safe side. The review of the Tekpower TP7244L is certainly not the be all and end all of devices, but will assuage old school types that can’t be without a needle. It is great for lower value signal monitoring on the bench and in the garage and gives fair readings. Alternatives: Along with the cheaper, non-lighted TP7244, Tekpower make other manual ranging multimeters, such as the more basic TP7040. This one has a lower category rating. For null variation tests, check out the Tekpower TP8250.